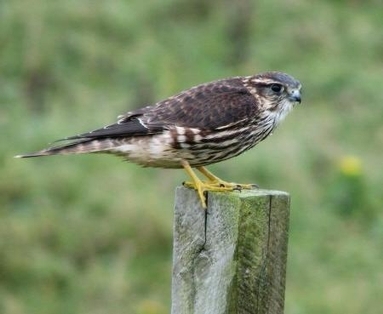 The smallest of the falcons is a truly magic addition to any day’s birding and on Arran winter is a good time of year to look out for Merlin. In Scotland, Merlin is a scarce resident breeder on upland heather moors. In addition passage and winter visitors are mainly to coastal and low-lying areas. It is a holarctic species breeding across northern Europe, Asia and North America. It is a migrant across most of its range with some European birds travelling to North Africa and the Middle East for the winter. Having said that, studies have shown that around three quarters of Scotland’s Merlins remain within sixty miles of their breeding area. As well as this resident population, the winter population is enhanced by birds from Iceland. From ringing returns, it is estimated that about a third of the British population in winter are from Iceland. These Iceland birds are mainly found on the west of Britain. This may help to explain why most of the Arran sightings are from the winter. There are no confirmed breeding records for Arran. This small thrush sized, dynamic, chunky falcon hunts in a distinctive way. Over open country it will fly relatively slowly towards its prey, small birds or large insects, rapidly accelerating into the final chase. In fast flight it has rapid wing beats followed by short glides, often with wings closed, which give it a thrush-like flight that may help to fool its prey. It is relentless in pursuit until the prey is exhausted. Much of its time is spent on low posts, rocks and even clods of earth scanning the landscape.